Back in ancient days, when you wanted a movie, you got off the couch and went to the video store. Sure, you had to leave your house and talk to a person (things no one has to do against their will in 2017,) but you didn’t need to wonder where to look for what. Every store had basically every movie. That’s not true today. Netflix, Hulu, and Amazon all offer a lot of movies, but figuring out what’s offered where is up to you. That’s where JustWatch comes in. 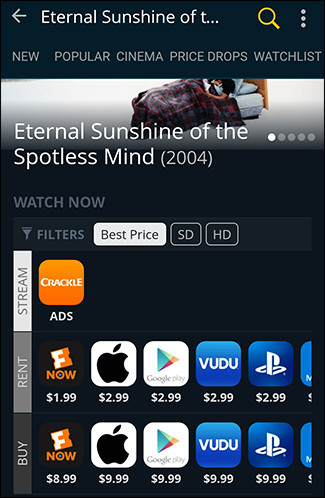 Instead of searching Netflix, then Amazon, then Hulu, JustWatch is a “streaming search engine” that lets you find out who is offering which movies and TV shows. If there are no streaming options for the movie or show you want, you’ll see where you can rent or buy it, and how much it will cost. 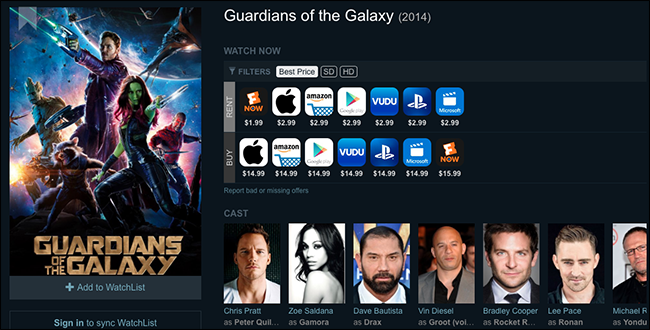 This feature is already available on some streaming boxes built-in, like the Roku. If it isn’t on your streaming box, there are several sites that can do the trick, including Cathod.tv and Can I Stream It. After testing quite a few, we settled on JustWatch for its superior results and layout. 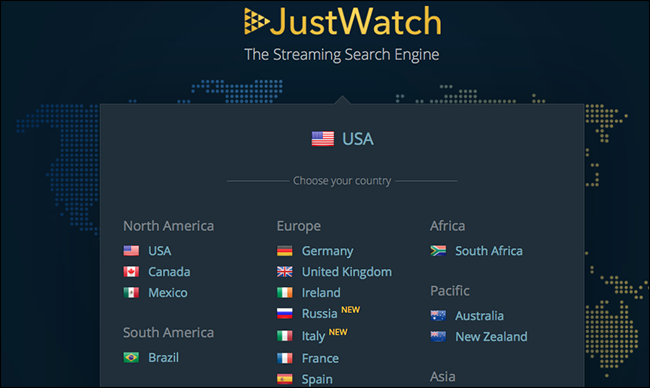 JustWatch supports multiple countries. You’ll be asked which country you’re in when you first use the site. As you can see, Pulp Fiction is (as of this writing) available for streaming on both Netflix and Hulu. If I have a subscription to one of these services, I can click the boxes to start watching right away. If I don’t have a subscription, I have a range of options to rent or even buy the movie from. Some movies aren’t available for streaming anywhere. In these cases, all I can do is rent or buy, so it’s nice to have one place to compare prices. Search results for TV shows are a little different. 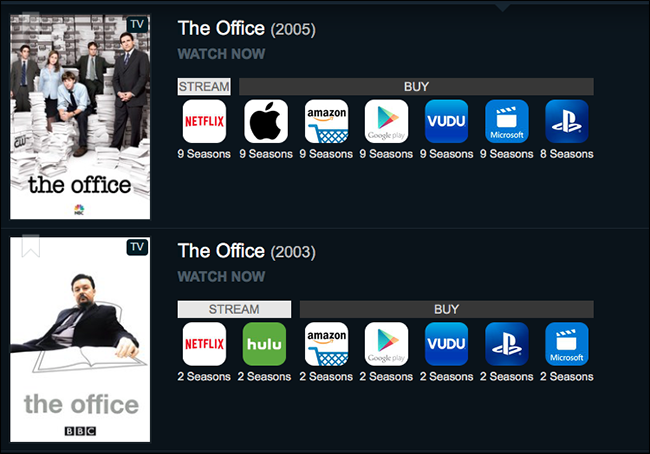 As you can see, the number of seasons offered by different streaming sources is listed, with stream and buy options clearly labeled. Seven seasons of Parks and Recreation (as of this writing) are offered by Netflix, while both Hulu and FXNow offer one season. If you’re looking to start watching a show, it’s good to know which service has the most seasons, especially if you’re considering dropping one subscription or adding another. You can click any of these boxes to be brought to the show’s page in the appropriate streaming service or online store. If you prefer to run searches on your phone or tablet, there’s an app for both Android and iOS, and it works about the same as the web version. It’s all very pleasant to use, and there aren’t even ads on the site itself or within the app. The about page says your searches are used as data to help target ads on sites like YouTube and Facebook, so you’ll be more likely to see movie trailers on those sites if you use JustWatch. If this bothers you, consider using private browsing when you look at the site.